Yeah, those are some quasi-cringe worthy words...but that's exactly what Sandy and I had on our shopping list for TJ's the other night. What it meant was, we didn't want to dip once more into our Costco sausage stockpile or have chicken again or anything too ho-hum. Nah, we wanted something that looked good and sounded tasty and not in our normal rotation, something that our not-terribly-carnivorous would probably eat without much complaint. Something we could all enjoy. Something, apparently, like Trader Joe's Boneless, Stuffed Pork Chops with Apple Almond Stuffing. Spotted. Acquired. Prepared. Consumed. Mmmm, impulse meat. At risk of sounding like that gravelly voiced Arby's guy, it's instinct. Easy enough to prepare, despite my demonstrably limited cooking talent. The instructions say to brown on each side before baking for 25 minutes. I, um, made the executive decision that they'd taste better a little blackened...yeah, that's it. No matter, the end product still tasted pretty great. 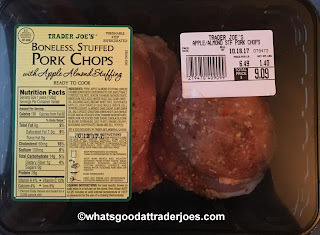 the pork chops themselves were meaty and tender, and certainly weren't too tough or stringy. 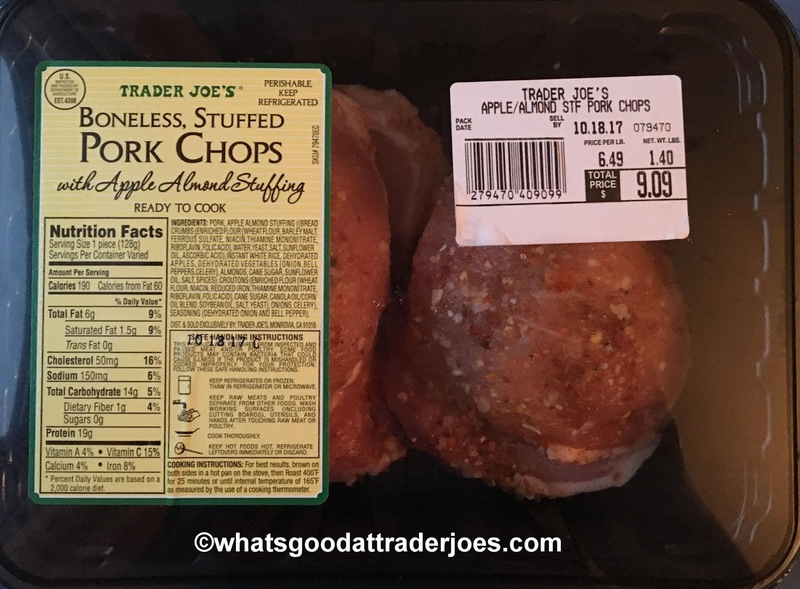 Aside from the natural goodness of the pork, there was a slightly sweet flavor, as if the chops were marinaded in some apple cider or something of the sort. And, of course, stuffing on the inside. I'm not gonna stretch the truth a bit and say it's super high quality stuffing that Martha Stewart would sign off on. Decidedly, it's more on the Stove Top end of the spectrum. Doesn't mean it can't be tasty. Growing up, my mom would sometimes cut up apples and put them in Stove Top, other times raisins. So maybe it's more nostalgia then actual critical quality, but man, I liked it. The slivered almonds added small, earthy, crunchy bite that worked very well with the soft stuffing and meat. It's $6.49 a pound, which isn't an awful deal. Our package seemed representative with two large medallions which were more than enough for the two of us and our girls. In all, they made for a good autumnal dinner alongside some squash mac and roasted Brussel sprouts. 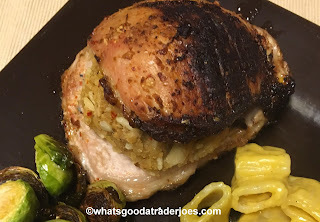 The stuffed chops might not be a regular buy, but for an impulse, not bad, not bad at all. Double fours. It nice to have something easy for dinner. Shortcut without the prepping. Plus it is exciting with addition of apples & almonds. I am a big fan of all stuffing- lowbrow or from scratch! The TJs cornbread croutons make awesome stuffing fyi. Oh man. This looks so tasty -- stuffing's always fun, and the flavor combination sound delicious. Easy to use too! Thanks for highlighting this. Do you believe, when I asked about these at my local Trader Joe's, the clerk checked and then told me they were discontinued! I will still check each time I go, in case he was wrong. Too bad if so. It's so sad when they discontinue something I love--but I hadn't even had a chance to try these!